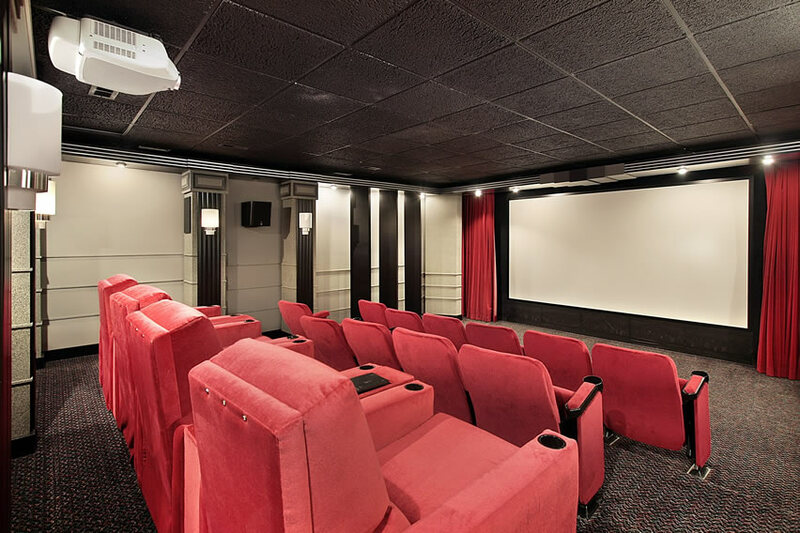 These home theater ideas showcase a variety of rooms with large movie screens and high end decor & furnishings. 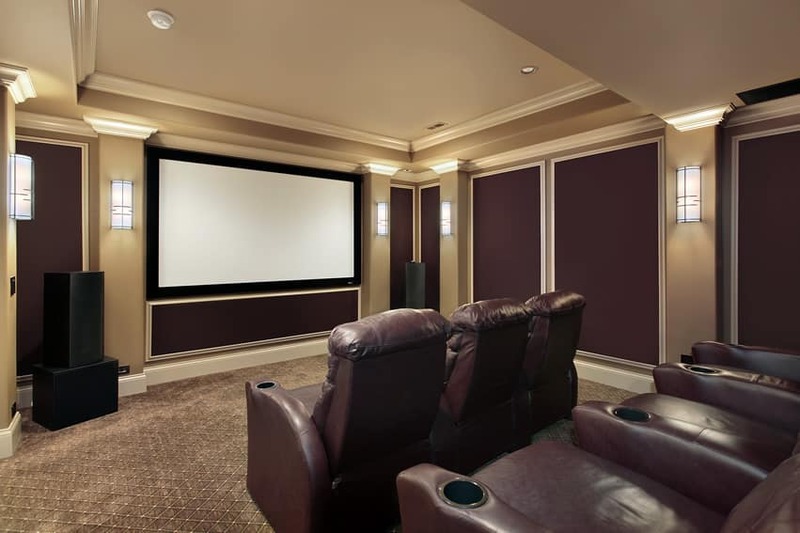 The ideal home theater closely resembles the feeling you get in a real movie theater with all of the audiovisual stimulation from the comfort of your own home. 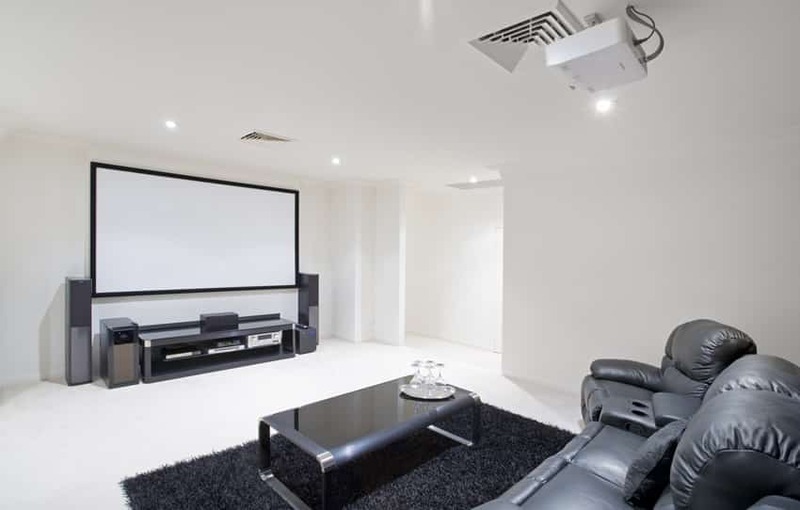 Creating the perfect environment for a home theater requires careful planning and design with emphasis on room acoustics, electronic equipment and comfort to achieve the best cinematic experience. 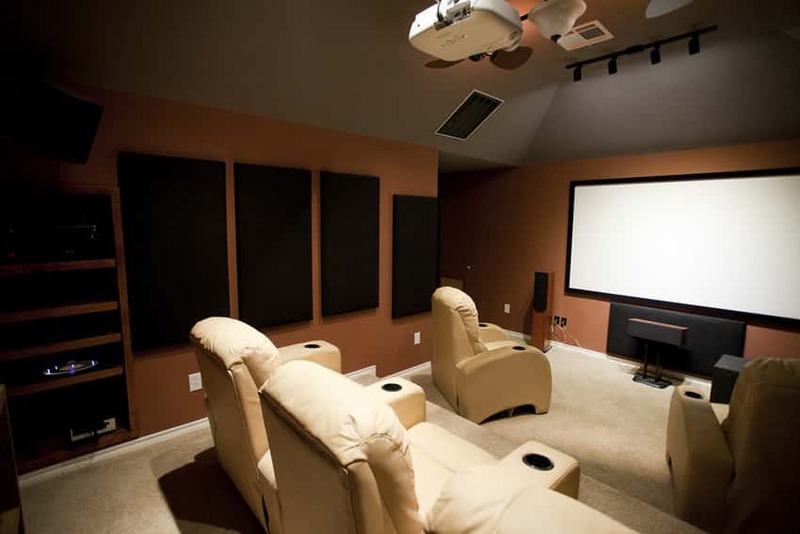 Below is a picture gallery with some amazing home theater systems. Let us know which one is your favorite. 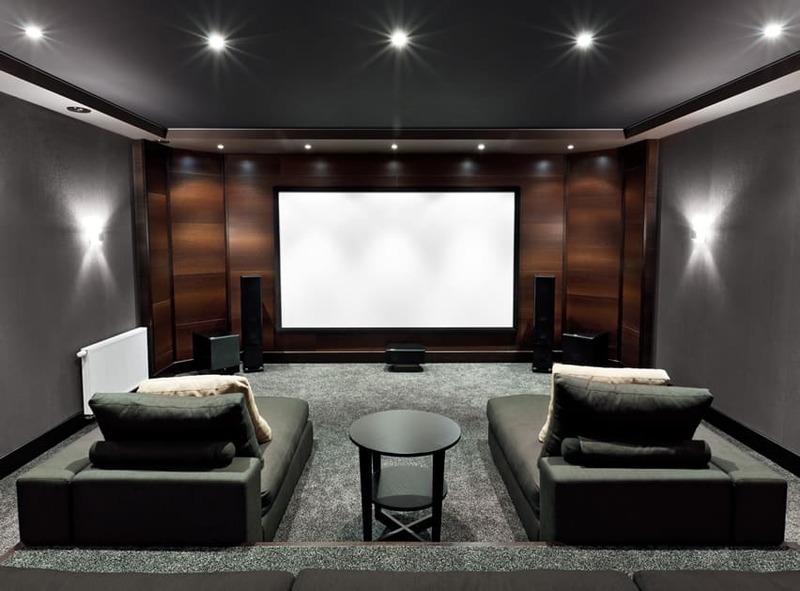 In the image above the modern home theater design is tastefully designed, with simple modern lines, comfortable furniture and classy finishes. The color scheme is dark grays combined with mahogany wood finish which adds a welcome touch of warmth to the space. Walls and ceiling are gray, with black baseboard and wall sconces for a dim light when needed. The floors are cozy gray carpet with a medium pile, making it comfortable if you intend to sit on the floor. The screen/projector wall is emphasized from the rest of the room as its wall is finished with mahogany laminates. Wired are concealed behind this raised laminated panel for a nice clean look. In this view of the home theater, you will see that the room has an upper level and lower level. The upper level is the raised platform in which you will find the sofa which can sit 3 or more people, while on the lower level, you will find 2 lounge seats with a black round side table between them. 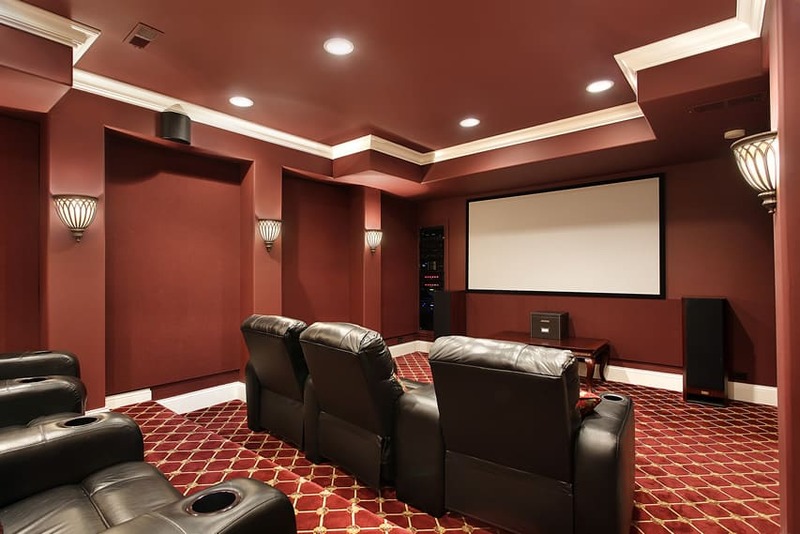 This home theater uses a nice shade of marsala paint for both its walls and ceiling, and is framed by white baseboard and cornice. The floor is covered with red carpet with gold diamond patterns adding to the comfort and elegance of the space. 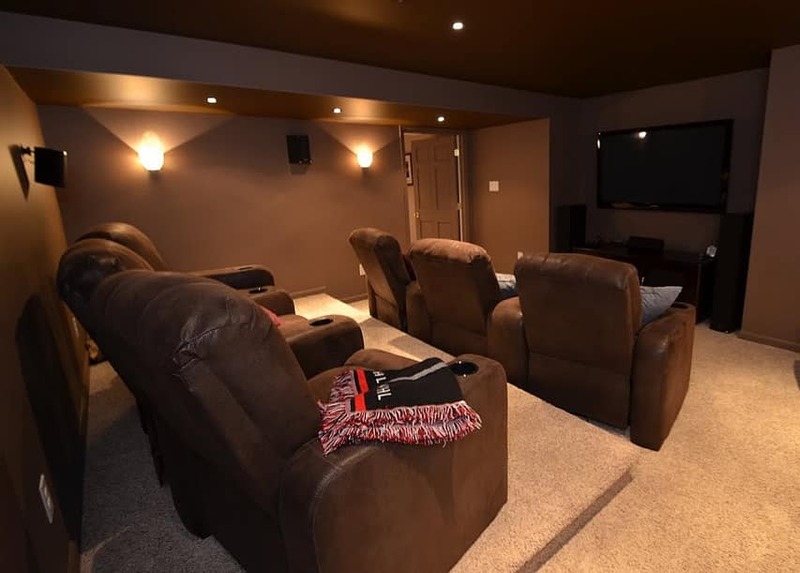 The media wall has a simple projector and a built-in audio unit, and for the seats, there are two levels and both has 3-seater black leather lazy boys. 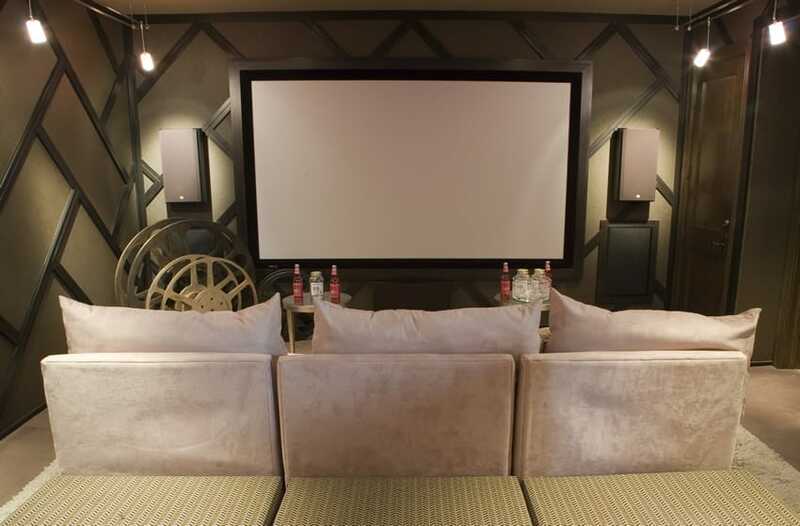 This media room/home theater goes an extra mile to give it a more luxurious look. Walls are paneled with light cream base color, gold moldings and red-and-gold pattern wallpaper which matches the detailed coffer ceiling with the same finish/treatment as the walls. The floors are fully carpeted in red with embossed patterns in the same color. For its media wall, no electronic unit is visible aside from the projector screen and low platform, and for the seating, there are two levels and both are furnished with brown velvet-upholstered lazy boy seats. 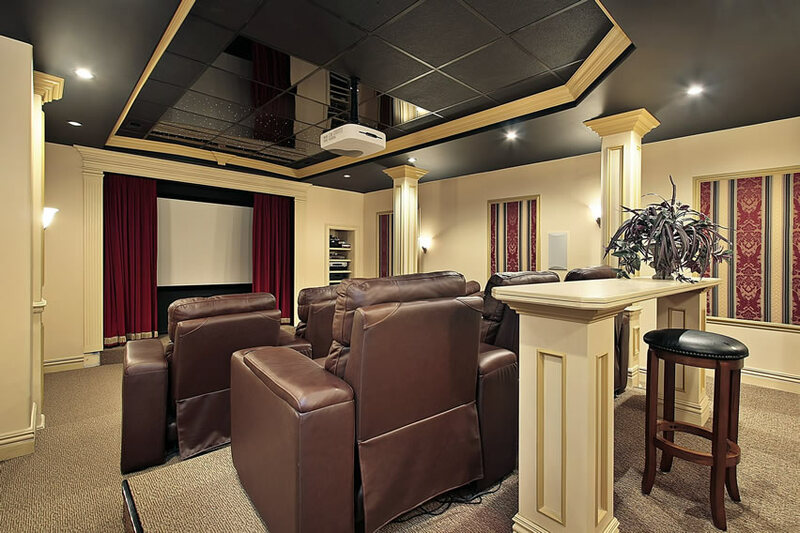 This home theater design is nice and cozy, perfect for those with limited room space. Most of the space have light-colored finishes: soft white walls, light beige carpet floors, light cream-upholstered L-shape sofa. The media wall, however, is veneered with black-stained wood. It has built-in cabinets in which all media-related items are kept. The speakers are attached on the wall but is concealed through a faux column finished with the same black-stained veneers. 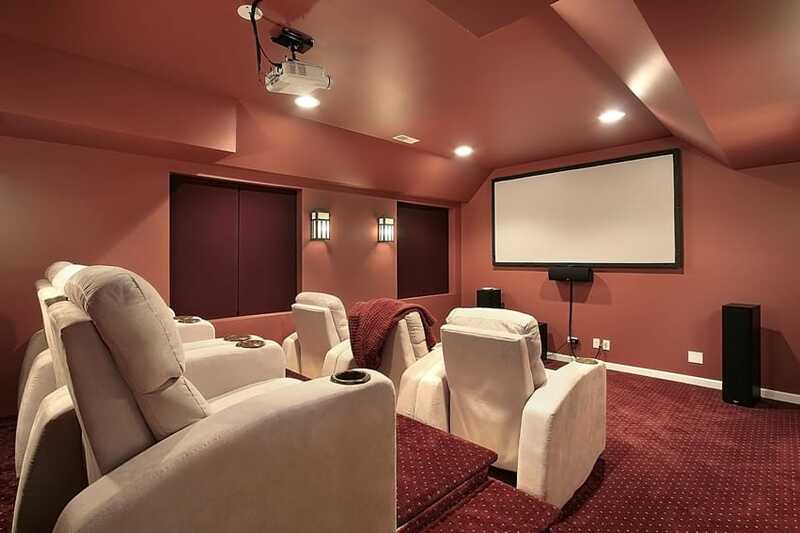 This home theater design combines beige and a deep plum shade for its over-all color scheme. Walls are paneled, with a combination of beige, white moldings and plum. The media wall is fixed with a simple large projector screen, and the floors is finished with beige carpet with simple diamond patterns. For the seats, it is fixed with 3-seater plum leather upholstered lazy boys. 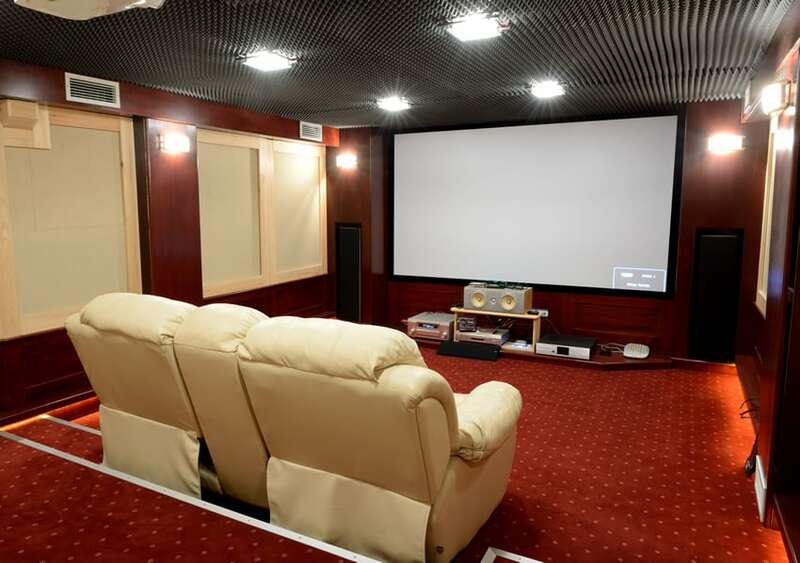 This is a simple home theater set-up, with olive-painted walls, beige carpet floors and a two-level floor fixed with beige leather lazy boy seats. The media wall is a simple movable wooden media cabinet in mahogany finish. The speakers are hidden behind the cabinets with fabric door face to let through the sound, and for the screen, a large LCD TV is placed on the media cabinet. 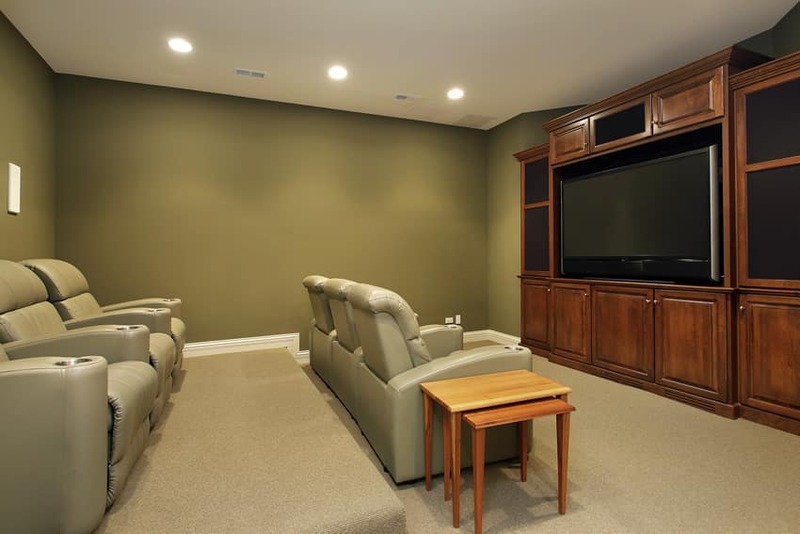 The simple light colors used in this media room give this home theater a refreshing and cozy appeal. The walls are in white, and the floors are a of a very light cream carpet flooring. 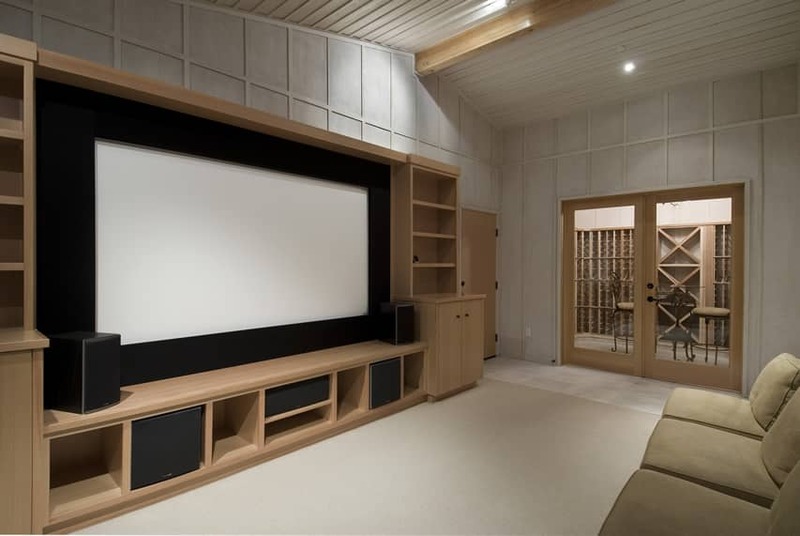 The media wall is a modular media cabinet fixed with a very large projector screen framed in black, while the media cabinet itself is laminated in maple, matching the finish of the doors and shelves of the wine cellar. The seats are simple but comfortable modern chairs upholstered in a light beige fabric. 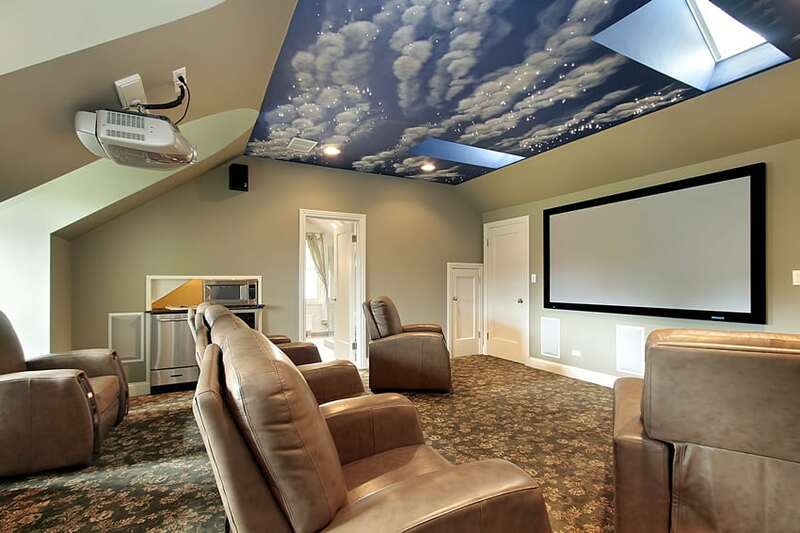 This home theater design is very simple and basic, but the most notable feature of this room would be its ceiling mural of the sky and its skylight feature. The room itself is simple and modern, with a simple projector screen, sage green walls and carpet flooring, and brown leather seats. Aside from the skylight and the refreshing ceiling mural, it also has fiber optic star ceiling installed, so during the night when it is darker, you can see the “stars” instead of the mural. 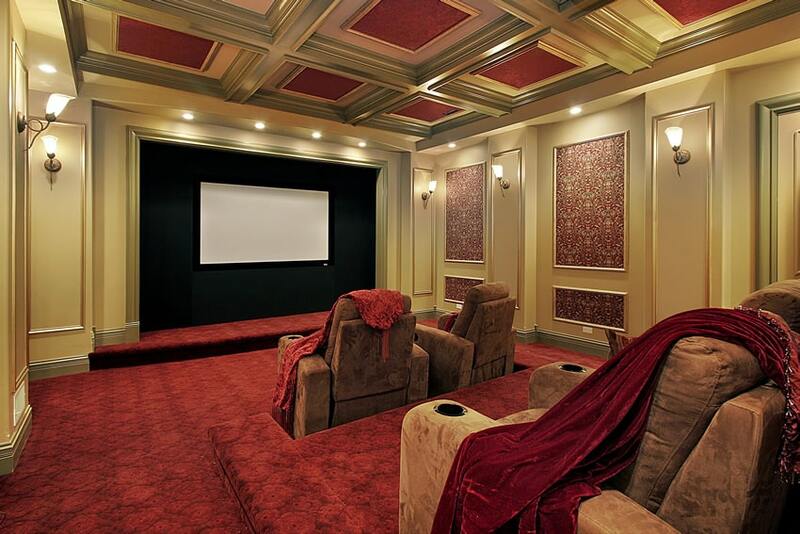 With classic detailing, this home theater design goes for a look that reminds us of small stages/theaters. It has a recessed wall where you will find the projector screen, and there is a red curtain you can use to cover it. There is also a small shelf niche at the right side to store and place media players, CDs and other related items. For furniture, it has brown leather lazy boys, 3 in each level, and a small table at the top level with a stool for the media operator. Another interesting feature of this room is the black ceiling which has reflective boards at the center, giving it a unique modern feature. Larger than the previous examples, this home theater is able to sit 16 people at once. The two lower levels have six-sitter cinema-style seats with red velvet upholstery, while the top level has 4 red velvet-upholstered lazy boys. The room adapts a dark color scheme of grays and blacks: gray walls with black accents, black-painted acoustic ceiling boards and dark gray carpet flooring. This design is perfect for a small modern home theater, with a casual living room feel. All walls are finished with stone tiles in a light mocha color, adding texture and pattern to the wall surface. The floors have wood laminated the same size as the stone tiles on the walls, adding a continuous pattern on the walls and floors. It has a large projector screen on the wall and a small low media console at the bottom. The furniture is a simple brown sofa with a matching bench and a small black side table. The scheme for this small home theater is on the reds: using red carpet flooring and red Mahogany laminate finish for its walls. The lower side of the walls has a concealed lighting to help illuminate the walk-ways when the lights are out. The speakers are integrated into the walls through a niche, and the acoustic panels of the ceiling adds texture and pattern to the room. 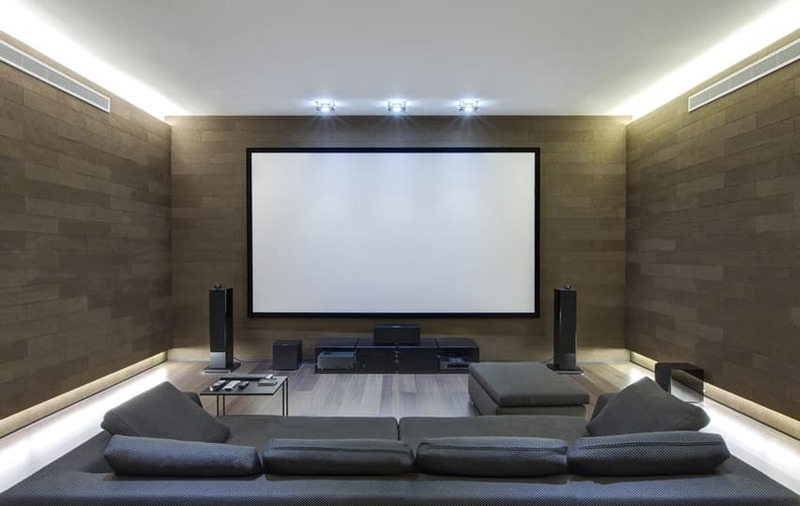 This is another modern and simple home theater set-up. Flooring is simple beige carpet, while its raised platform is finished with wood planks. For the walls, the lower walls are painted in a deep red shade while the upper walls are in an off-white shade, framed with white baseboard and chair rails. The media wall only has a large projector screen at a comfortable distance from the black leather lazy boy chairs. Another theater design with neo-classic aesthetic, this design uses paneled lower walls, and faux columns as design elements. The upper walls are plain and painted in a mocha color with wall sconces and the floors have dark violet patterned carpeting. For the furniture it has black leather lazy boy chairs. This is a unique and interesting modern design for a small home theater. The mocha-painted walls has an interesting pattern made from rectangular wood frame arranged in a herringbone pattern, adding texture and interest to the walls. The projector screen is framed with wood in the same dark mocha shade used on the rectangular wood panels, while the floors are carpeted in light beige. The furniture is a simple modular sofa, synthetic rattan benches in beige, 2 gold side tables and large decorative film reels as accessories. 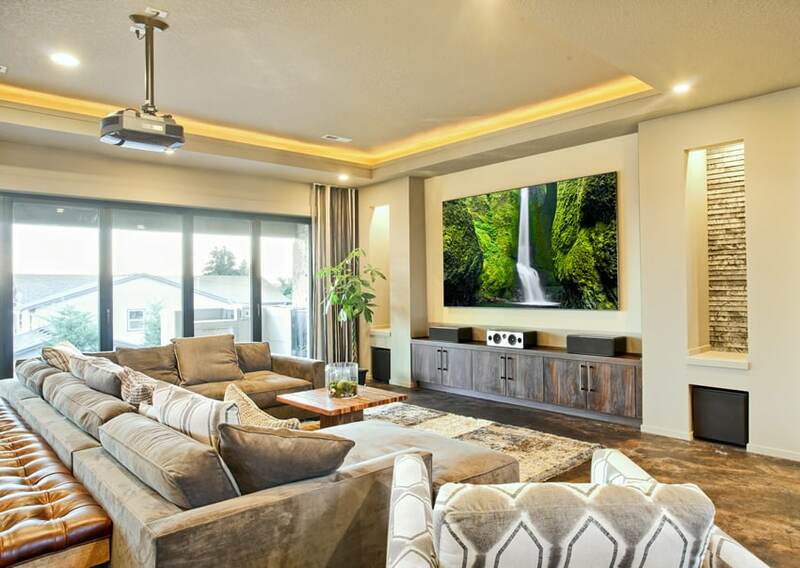 A cozy living room-style home theater is both appealing and more multi-purpose than typical home theater set-ups. This one is a good example of such. It has large windows which you can close off with black-out curtains and give a more homey feel to the space. Floors are unique tiles with a rustic texture, while walls are plain in an oat-meal shade. The wall has small niches for the speakers, a low entertainment console under the projector screen, a large modular sofa in gray which is able to accommodate 6 or more people, a coffee table, a large area rug and a tufted leather bench behind the sofa which can be used as extra sitting area. 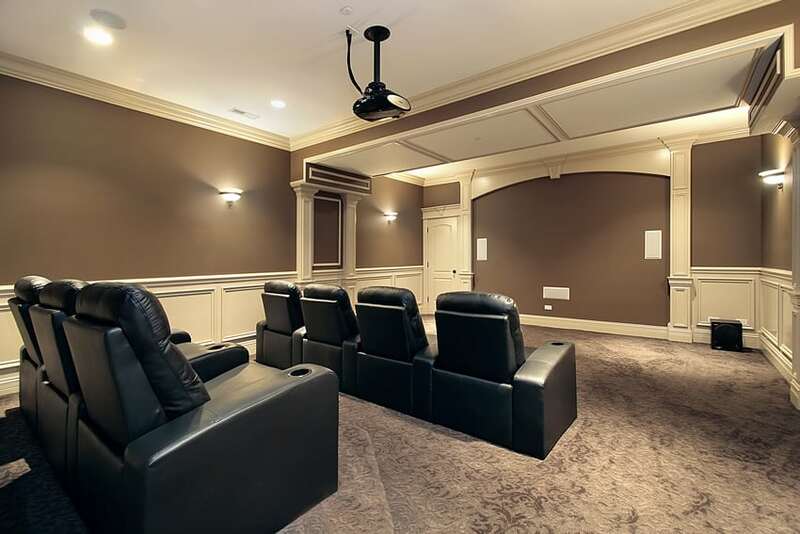 A simple home theater set-up with a neutral brown color scheme – it has dark brown walls, light cream carpet flooring, brown leather lazy boy seats and a ceiling with the same color of the walls to maintain a dark atmosphere in the space. The entertainment cabinet is placed on the wall niche along with the LCD TV. 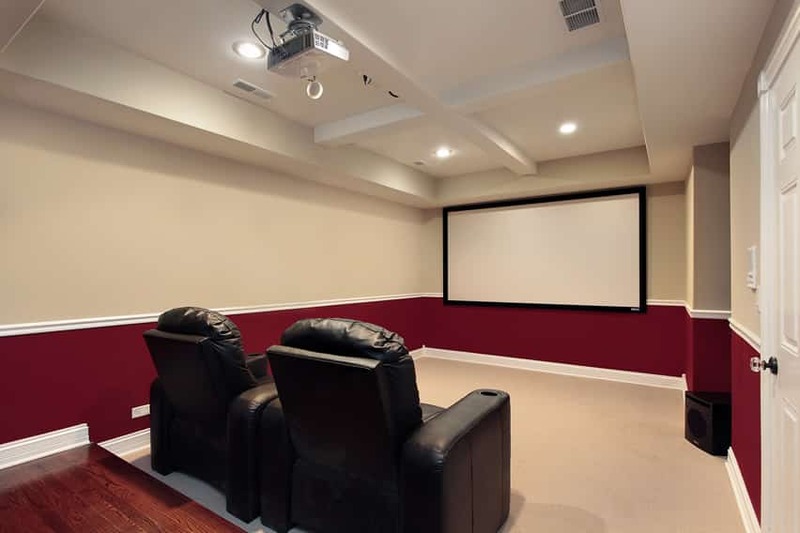 Another easy to-follow home theater set-up, it has plain sienna brown walls, gray ceiling and light beige carpet flooring. On the walls you will see a black fabric-upholstered padding which is both decorative and also helps with the acoustics of the space. For the furnishings, it has white leather-upholstered lazy boy seats and a wooden shelf at the back side for storing media players and other similar items. This set-up can be applied on any minimalist modern living room. It has a bold blue paint on its walls, white floors and a wood-laminated wall panel to highlight the media wall. On the wall is a large LED TV, and there is only one sofa at a comfortable distance from the screen. It also has movable floor surround-sound speakers. 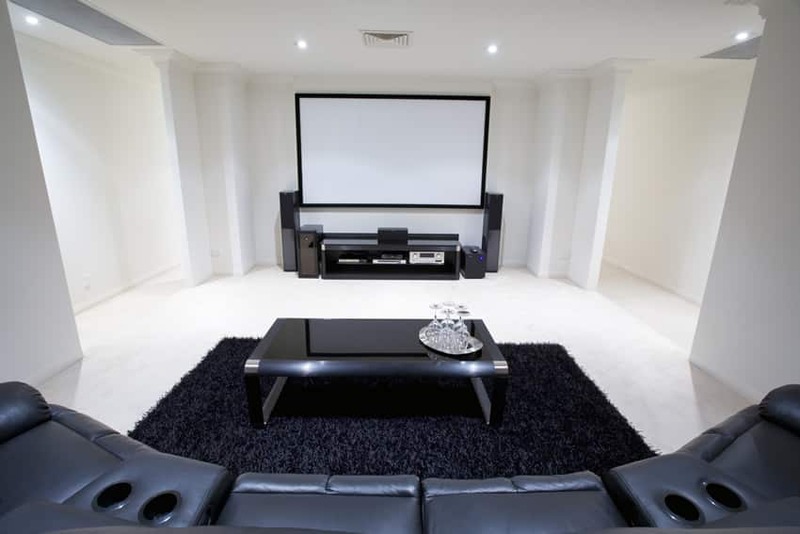 A simple modern home theater set-up with a nice black and white color scheme. You can see that most of the room is white – white floors, walls and ceiling with no baseboards or cornice. It is also sparsely furnished, with only the essential pieces. 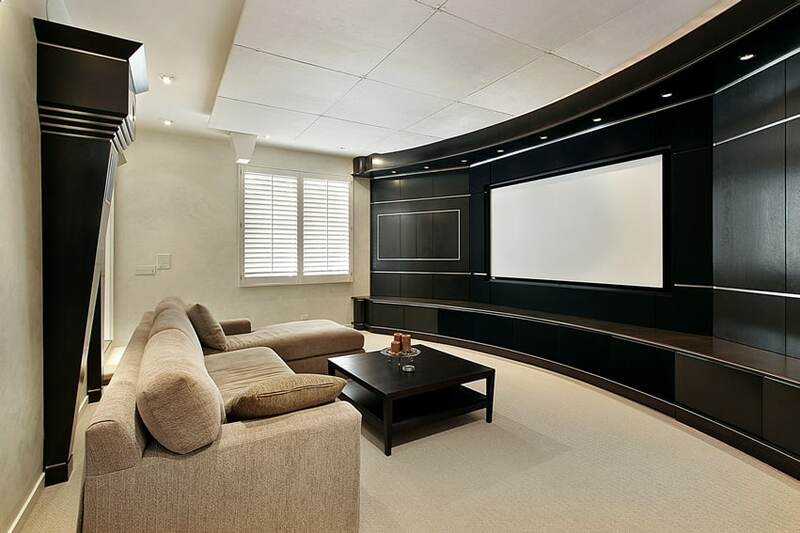 Home theater ideas that are minimalist focus your attention of the movie screen with little decor or distraction. 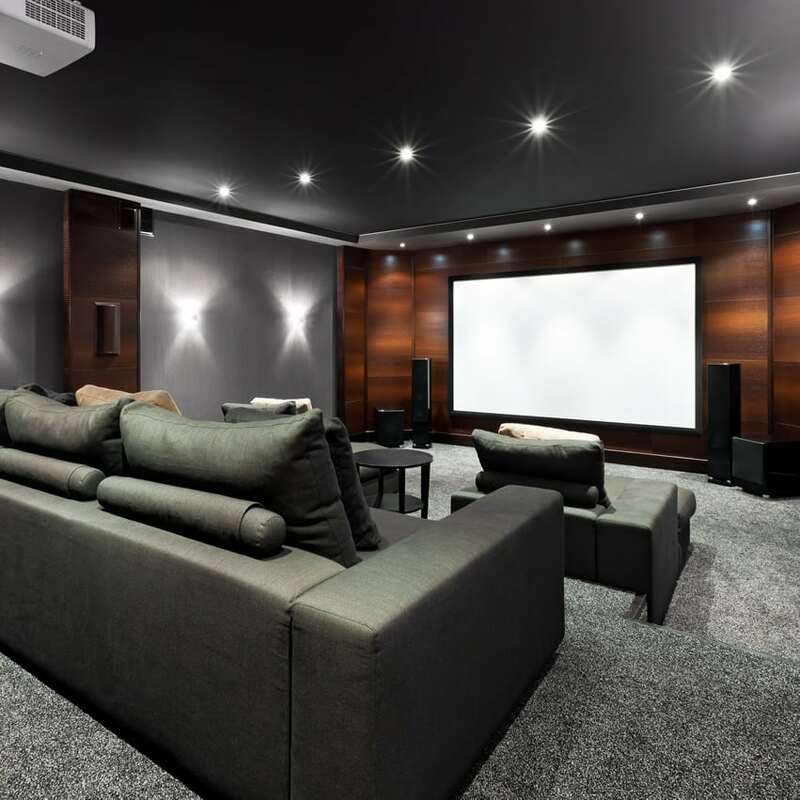 In this view of the home theater, you will see the black high pile area rug which helps “frame” the sitting area, the semi-circular lazy boy sofa, the modern black coffee table and media table. 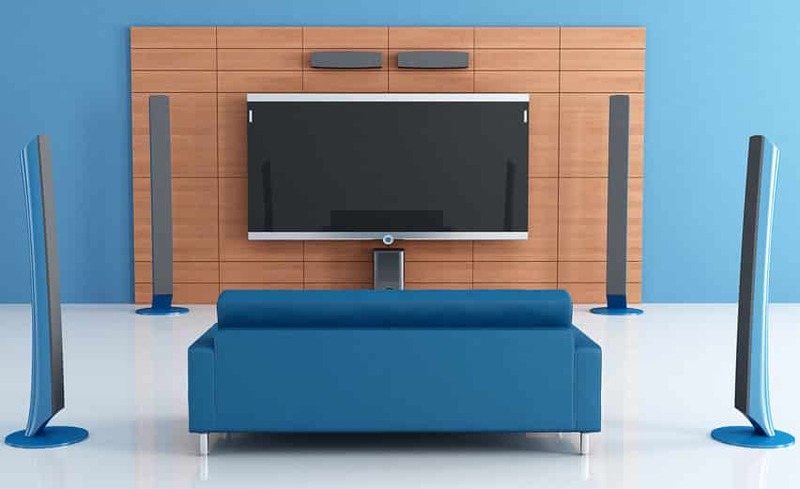 The set-up is modern minimalist, giving you all the essentials of a home theater without putting unnecessary items in your way.